Gwendolyn is really doing well in her stander and she is LOVING EVERY SECOND OF IT! - which is all that matters. She's up to 50-55 degrees for about 20-30 minutes. 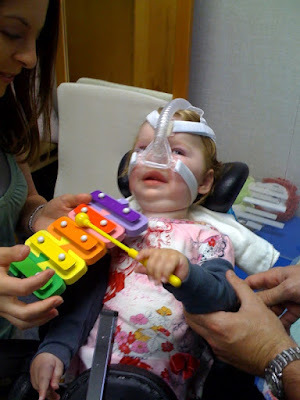 This week, she smiled ear-to-ear when we put her in the stander at her weekly CCS therapy session and starting raising her up. But, the highlight was definitely playing the xylophone. Yes, the xylophone! She absolutely loved it! We'll definitely be getting a xylophone for home.